7 WordPress Maintenance Mode Plugins - Which One Stands out? 7 WordPress Maintenance Mode Plugins – Which One Stands out? You have a great idea for a website or are launching a new product on your existing website. Building it will take some time so it’s best if your viewership didn’t stumble upon a half-finished site and disregard it before it's launched. A maintenance mode plugin allows users to prepare for launch, make edits and do some routine maintenance without risking their brand’s image. 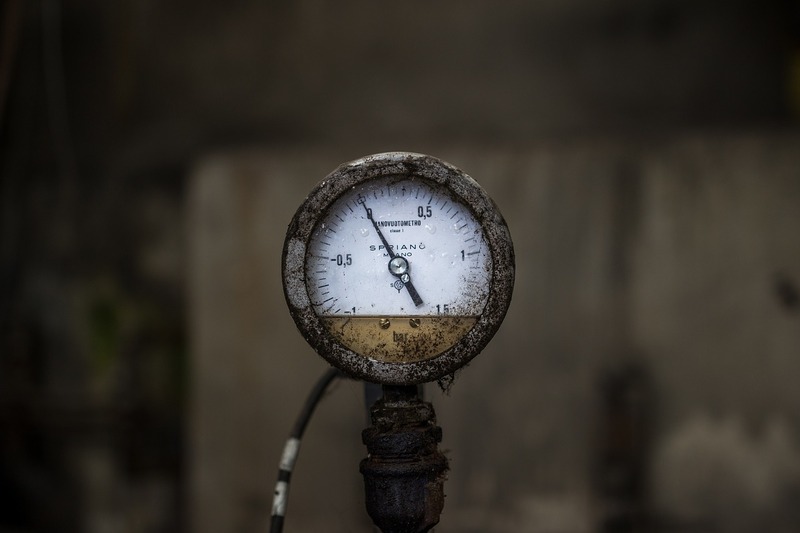 In this post, we will cover some free plugins which can be used to set up maintenance pages and discuss the standout feature each one has to offer. Finally, we'll wrap up with a section on how to choose the right maintenance mode plugin for your site. Let's put everything into context before we begin. Every website undergoes some sort of maintenance at some point in its lifetime — whether you need to update core files, revamp its design, or prepare for the launch of your latest product. And if you'd rather not have your viewership land on a broken area of your site or encounter errors, you will need to make it temporarily unavailable. Ensures your viewership doesn’t see a half-finished site. A half-finished or broken site could potentially damage your site's reputation and increase its bounce rate. Can be used as a marketing tool. A maintenance mode page can be used to reinforce your brand in the mind of visitors and keep them posted about the updates you're working. Creates hype. Use your maintenance mode page to generate some buzz and drum up excitement — give your viewership a sneak peak of your latest product. If you're thinking about putting your site in maintenance mode, you're going to need a plugin to help you set up the maintenance page. We've gathered some of the best, free plugins to help you set up a maintenance mode page on your WordPress website. 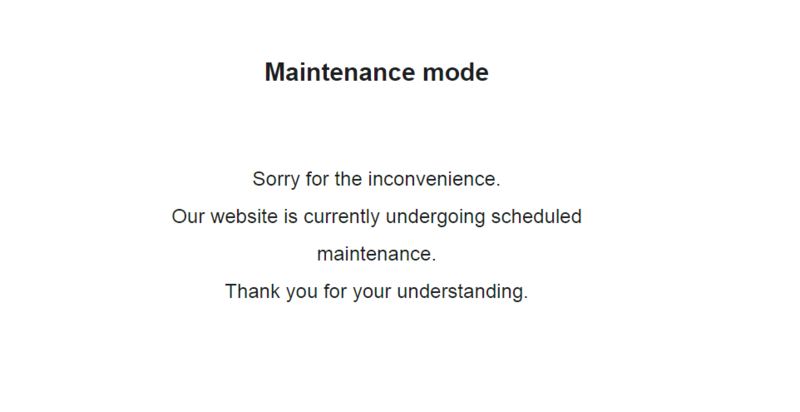 If you're looking for a complete solution to implement a simple maintenance mode page on your website then SeedProd's Coming Soon Page & Maintenance Mode plugin is a top contender in this space. This lightweight plugin offers the full range of functionality in an easy to configure package. The free version comes with basic functionality and when you're ready to take things to the next level, you can upgrade to the premium version. Fully responsive design that's easily customizable. Enables users to add custom CSS and HTML. Support for BuddyPress and WordPress multisite. WP Maintenance Mode is a lightweight plugin that allows WordPress website owners to set up a fully responsive maintenance mode page for their site's viewership. The standout feature on offer here is that it allows the admin to register users who can view the site's front end — even when it's still in maintenance mode. Enables users to set up subscription forms, contact forms, and a countdown timer. Comes with landing page templates right out of the box. Ships with social media icons and SEO options. If you're looking for a maintenance mode plugin that's easy to install and comes with a killer design then it's difficult to look past the Coming soon and Maintenance mode plugin. This one-of-a-kind maintenance mode solution offers incredible functionality with a focus on visual impact. The Coming soon and Maintenance mode plugin also allows users to add a video background to their page! Fully responsive design with tons of customization options. Comes with social media buttons. Allows users to disable maintenance mode for specific IPs. User-friendly back end for easy configuration. Maintenance Mode is a simple and elegant maintenance mode plugin that gets the job done. The lightweight plugin is designed to work as part of the WordPress core. It comes with a WYSIWYG editor that enables website owners to add custom links and images to their maintenance page to enhance its functionality and visual appeal. Enables users to set role control options. Comes with a customizable design and WYSIWYG editor. Allows admin to preview the maintenance page without having to leave the back end. The EZP Maintenance Mode plugin is a simple and intuitive plugin that enables website owners to let their viewership know what's going on under the hood. The plugin is incredibly user-friendly and comes with pre-integrated mini-themes that make setting up a visually appealing maintenance page all the more easier. Wide-range of professionally crafted mini-themes to choose from. Options to add your own logo for branding. One thing you won't be short on with Minimal Coming Soon & Maintenance Mode is options. The plugin features a wide range of customization options and functionality that allows users to create a maintenance page that stands out. If you're into typography then creating a stylish page with the plugin's Google Fonts integration will be a breeze. Allows users to fully customize each page element. Comes with MailChimp email integration. Ships with a powerful options panel. Supports W3 Total Cache and WP Super Cache. The IgniteUp - Coming Soon and Maintenance Mode plugin ships with four different customizable templates to choose from. It's an easy to use plugin that lets users create a fully functional maintenance page in under a minute. The standout feature on offer here is that it informs search engines that your site is under maintenance to prevent any adverse effects. Fully responsive design powered by Twitter Bootstrap. 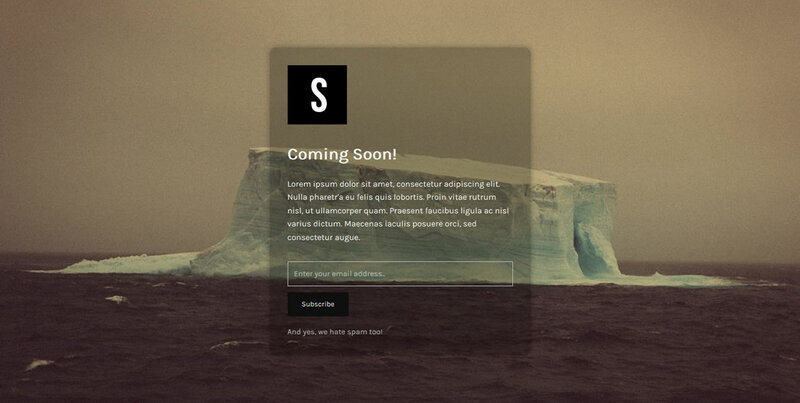 Comes with email subscription forms for MailChimp and MailPoet. Enables users with secret URL or whitelisted IP to view the normal website. 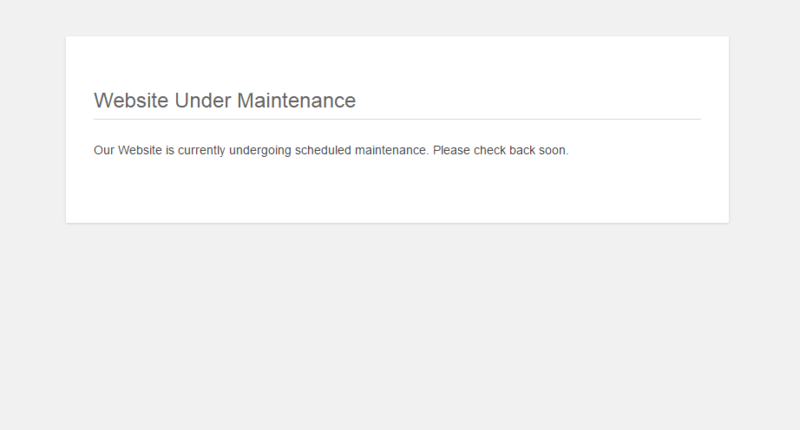 Notifies search engines that your site is down for maintenance with 503 response. If you're looking for a complete maintenance page solution with a simple design and intuitive interface then Coming Soon Page & Maintenance Mode by SeedProd is difficult to beat. However, if you'd prefer one with a bunch of customization options and a focus on visual appeal then you're better off going with the Coming soon and Maintenance mode plugin. Lastly, if you have a team of developers working on your site then you're probably going to need to whitelist IP addresses or create a secret URL. For this purpose, IgniteUp – Coming Soon and Maintenance Mode works like a charm. Ensure your viewership doesn’t see a half-finished site. Be used as a powerful marketing tool to capture advance interest. Create hype for your website or product launch. How do you manage making edits to your WordPress website? Let us know by commenting below! This is good list of wordpress plugins to signal your visitors that the site is under maintenance. 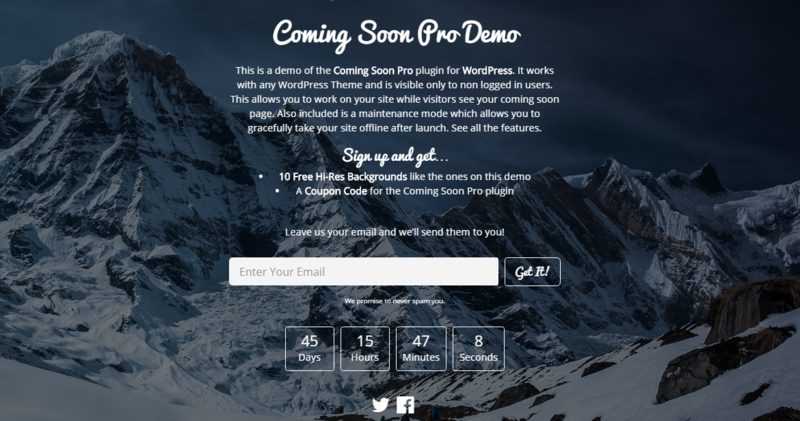 I personally use Maintenance WP Plugin and it works great and is easy to use. We will run an update for 2017 but its going to take some time.